Business office hours: Monday-Friday 8 a.m.-5 p.m. Membership: membership@kut.org or call 512-475-6100. Pledge: 512-471-6291 (or 1-888-471-6291), or click the donate button at the top right-hand corner of this page. Public Service Announcements: Our Traffic Manager can be reached at psa@kut.org. Tour Requests: Please click here for more information about touring KUT and KUTX. Tech issues: For web-related issues, our web manager can be reached at tcallahan@kut.org. For issues with the media player and non-web technical issues, please contact our tech staff at tech@kutx.org. Companies or organizations interested in becoming a program sponsor can call 512-471-8222, send an email to underwriting@kut.org, or learn more at sponsorkut.org. 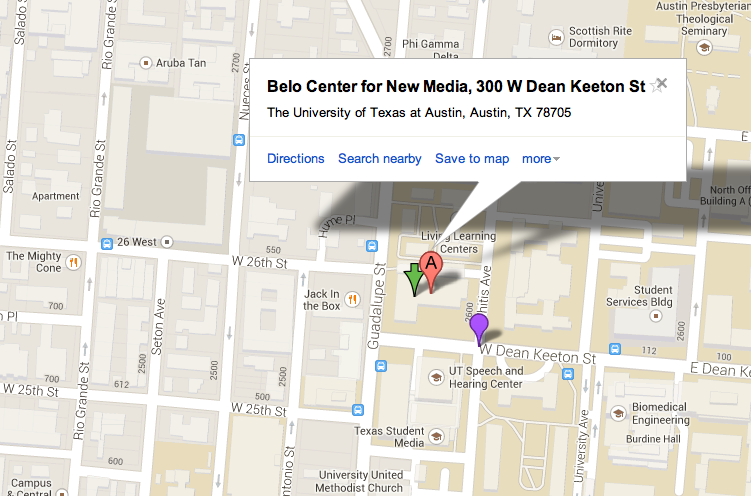 We’re located at 300 W. Dean Keeton, which is at the northeast corner of Dean Keeton and Guadalupe, in the Belo Center for New Media, on the University of Texas campus. Our main entrance is on the street level. When you arrive in the lobby, please check in with our front desk to announce your arrival and someone will come greet you in the lobby. ▪ From Loop 1, take the Windsor Rd. exit east to Guadalupe St.
▪ Turn left on Guadalupe St. and go two blocks to Dean Keeton. ▪ Turn right on Dean Keeton. ▪ Turn left on Whitis Ave.
▪ Take an immediate left into the alley behind the Belo Center for New Media. KUT Visitor spots are available by permit only so be sure to arrange a permit exchange with the KUT staff member you are visiting. Additional information on parking below. ▪ Take exit 236A and take the 26th St exit. ▪ Merge onto Dean Keeton St and go approximately 1 mile. ▪ Turn right onto Whitis Ave.
▪ Take exit 235A toward 26th St./Manor Rd. ▪ Stay on frontage road to Dean Keeton St. Turn right onto Dean Keeton St.
▪ Go approximately 1 mile. ▪ There are some KUT and KUTX Visitor spots available in the alley behind the Belo Center for New Media. The alley is located directly off Whitis Avenue. Spots are by permit only so be sure to arrange for a permit with the KUT staff member you are visiting. ▪ There is limited metered parking along Guadalupe, Dean Keeton (26th) and 27th Street. ▪ Nearby pay lots and garages are at 25th and Guadalupe (lot), San Antonio parking garage at 25th and San Antonio, and Speedway parking garage at 27th and Speedway. KUT is unable to validate parking. ▪ Several bus and university shuttles drop off near the building. Route information can be found at www.capmetro.org.